UPDATE: Yesterday, a reader asked for a comparison of HCS’s enrollment numbers to Madison City’s and Madison County’s enrollment numbers. While it is important to remember that both systems are smaller than Huntsville City, both of these systems have experienced substantial growth over the past decade. Madison County has grown at a 7% (from 18,151 to 19,452) rate over that period mostly from the addition of a Pre-K program. Madison City, which should not be a surprise to anyone, has had phenomenal growth over that period of 29% (7,789 to 10,011). This is, in case you were wondering, what “adding an elementary school every year and a half” actually looks like. Madison City is growing at a rate of about 220 students per year. Huntsville School Superintendent Dr. Casey Wardynski said Friday that his nearly 24,000-student system isn’t shrinking from white flight, but growing, getting better and meeting challenges like a federal desegregation order and brawling Grissom High School students. First, let me apologize for borrowing the “white flight” term that frankly always makes me a bit nauseous when I hear it being used. Its implication is that since the white people are “fleeing” this means that a city is in decline. The reason that I’m using it here is simply because it is clear from the text of Roop’s article that Wardynski was (and likely is) worried about giving the impression that all the white people are running away from Huntsville City Schools to the “area business leaders” in attendance. Despite this, Wardynski did say three things in this article that need further consideration. Those are wonderfully precise examples, aren’t they? Funny, when he said “adding an elementary school every year and a half,” it sounded much bigger, didn’t it? Almost like we’re bursting at the seams. Let’s look at the actual numbers and see if there is any truth to this? Here’s a chart tracking Huntsville City Schools Enrollment over the past decade from 2005-2006 through 2015-2016. As you can see, there are two lines on this chart heading in two different directions. The blue line represents total enrollment from the newly expanded free Pre-K classes that Wardynski has added since his arrival in 2011. The green line represents the total enrollment without the addition of the Pre-K classes. Counting Pre-K, Huntsville City Schools enrollment has increased from 22,994 students in 2005-2006 to 23,827 in 2015-2016. You can see these numbers for yourself on the Alabama State Department of Education’s website. Thus according to the data that HCS has reported to the ALSDE over the past decade, Huntsville City Schools enrollment has increased by a total of 833 students or 2.8% growth. And all of this growth is directly attributable to the expansion of a free Pre-K program. If you remove the Pre-K from the totals, the trend line for grades kindergarten through 12th is steadily down. K12 enrollment has dropped from 22,870 in 2005-2006 to 22,764 in 2015-2016 or a loss of 106 students over that period. Huntsville City Schools enrollment growth hasn’t begun to keep up with the population growth over that same time. By way of comparison since Wardynski mentioned that he believes that he’s educating “about 80 percent of the children who are school age in Huntsville,” the City of Huntsville’s population has grown by 13% over that period from 166,321 to 188,226. Assuming that Huntsville percentage of the population that is 18 and under is basically the same as the state’s rate (23.7%), then Huntsville has approximately 44,609 children under 18. If HCS were educating “about 80 percent” of those children, I’m fairly certain that our enrollment would be 35,687 not 23,827. According to this number Huntsville City Schools is educating about 53% of the school aged population, not 80%. But what’s 27% between friends? Nearly half (47%) of the school-aged population of Huntsville goes to private schools or is home-schooled. Nationally, by the way, only about 10% of school-aged children attend private schools, and that number has been on a steady decline. Nationally, only about 3% of school-aged kids are homeschooled. The national average of public school enrollment is about 87 percent. In other words, even if Wardynski’s unsupported estimate of 80% of Huntsville’s school-aged population attending HCS were correct, that would still mean that Huntsville has a significantly lower percentage of students attending public school than then national average. Wardynski said his percentage of students on the “free and reduced lunch program” – an indicator of lower household income – is “fairly high.” But he rejected the numbers on the printed breakfast program that said 9,346 of Huntsville’s 23,827 students – or 39 percent – is getting free or reduced price lunches. You would think that the superintendent of the district would be able to recognize his own data that he’s submitted to the Alabama State Department of Education, especially a “numbers guy” as he likes to call himself, but you would be mistaken. Those numbers “came from” the Alabama State Department of Education’s website. 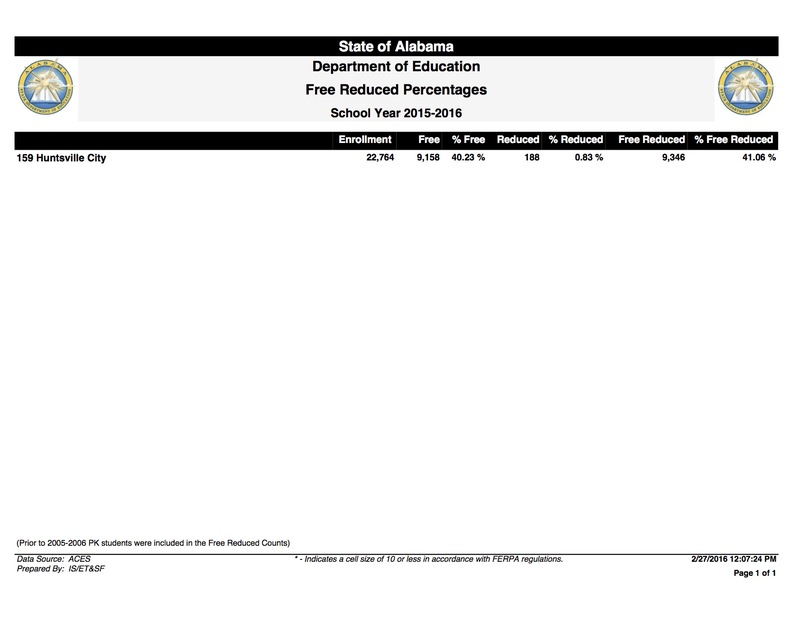 Below you can see the report from this site that shows that the district’s percentage of free and reduced is 41 percent of the K12 student enrollment. When you include the Pre-K numbers in the mix, that percentage drops to 39. The Numbers Guy regularly gets his numbers wrong usually whenever the actual numbers would make him look bad. It would seem that the State Department of education also has questions about the school incident numbers that Wardynski has been sharing with them. The one thing you should always keep in mind when it comes to data that Wardynski shares with you is that it is rarely reliable. Based on every external, reliable data point that is available to us, it would seem that Dr. Wardynski’s claims that people aren’t leaving Huntsville City Schools is wrong. Despite being the only major metropolitan area in Alabama that is experiencing population growth, Huntsville City Schools’ enrollment numbers are at best described as flat despite a significant expansion of services with the development of the Pre-K program. Just like our teachers who are fleeing this district because of Wardynski, it seems that students are doing so as well. “According to this number Huntsville City Schools is educating about 53% of the school aged population, not 80%. But what’s 27% between friends?” Once again, thank you for being the media we wish we had instead of the media we have. I imagine the reason that the free/reduced meal population looks higher than expected is because of the program that makes that resource available to ENTIRE schools, whether or not individual students would qualify. Doesn’t excuse the board’s lack of familiarity with their own numbers, but that’s a potential explanation for the growth of that statistic. Actually, I didn’t include it as it was somewhat off topic, but that number has actually gone down in the past couple of years. I think this follows the economy fairly closely. From 2005-2009, the percentage hung between 38-43%. In 2009-2014, it climbed to as high as 53% (in 2014). Last year it dropped to 38% and this year was 41% which is about average for the past ten years. I’m not sure why Wardynski was trying to undersell it in this meeting. I suspect he was picking up a vive from the group that it was too high. Well then those numbers make absolutely no sense. When you have entire schools who are served free meals, the trend should be dramatically upward. Since there’s no qualification paperwork in those schools, there’s no ongoing assessment of whom would otherwise be above or below the income ceiling. All you have are numbers of kids RECEIVING free meals. How would you suppose that the percentage can go down? (Not quibbling with your reporting, just wondering about the accuracy of the stats). Under the current system, even schools like AAA (which has traditionally included students from very diverse income groups) were given school-wide free meals because they are considered a feeder school for Lee, which DOES exceed the percentage of students necessary to qualify for this program. And New Century ALSO gets free meals automatically because it’s co-located with Lee. Not that ANY of this has anything to do with a discussion of education quality, simply curious how the numbers guy would explain the apparent inconsistency. And isn’t it odd that he’d get defensive about this, since family income is one factor that the school system can’t control. Oh I question the accuracy of the stats as well. No worries. I had the same thought. It’s possible that the schools that have free lunch for everyone, aren’t being counted. Or they aren’t being counted accurately. I have no great insight regarding the reason(s) for changes in the HCS student population. However, I did take note (last Fall I think) of several TV advertisements for HCS. I thought it was very unusual for a public school system to advertise for students … I had never seen anything like it before. At the time, I though that there must be something very wrong if taxpayer provided education must be “sold” to the residents. Actions do speak louder than words. That selling of the district has only been stepped up in recent months. This is particularly true of the billboard advertising that promotes things like School Board Appreciation month. Thank you again for fighting the good fight, getting the real story out, for being teacher/student/parent advocate. Thanks. And thank you for all you do as well. Russ I don’t thank you enough for your tireless work to keep us informed. You are the best source to know what is going on. No thanks necessary. Thank you for reading!